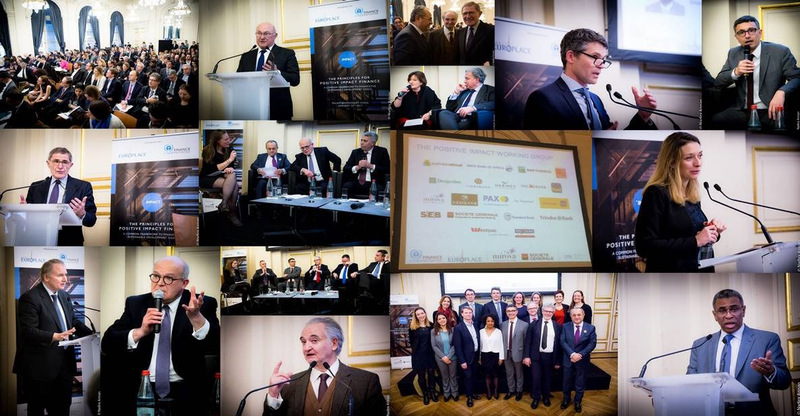 The Principles for Positive Impact Finance were launched in Paris on January 30th 2017 by 19 leading banks and investors totaling $6.6 trillion in assets. They provide a global framework applicable across their different business lines, including retail and wholesale lending, corporate and investment lending, and asset management. High-level representatives from the financial sector and M. Michel Sapin, French Minister for the Economy and Finance attended the launch. This unique event gathered approximately 200 participants including commercial banks, investors, insurers, corporations, rating agencies, analysts, auditors and public sector representatives from central and municipal governments, multilateral and development banks, and UN bodies. Michel Sapin, French Minister of the Economy and Finance. Séverin Cabannes, Deputy CEO Société Générale. Elliot Harris, Assistant Secretary-General and Head of the New York Office of the UN Environment Programme. Eric Usher, Director of UNEP FI. Further information on the Positive Impact initiative is available here.